A while back we adopted a group of young llamas from Jenny that were waiting for a new home.... 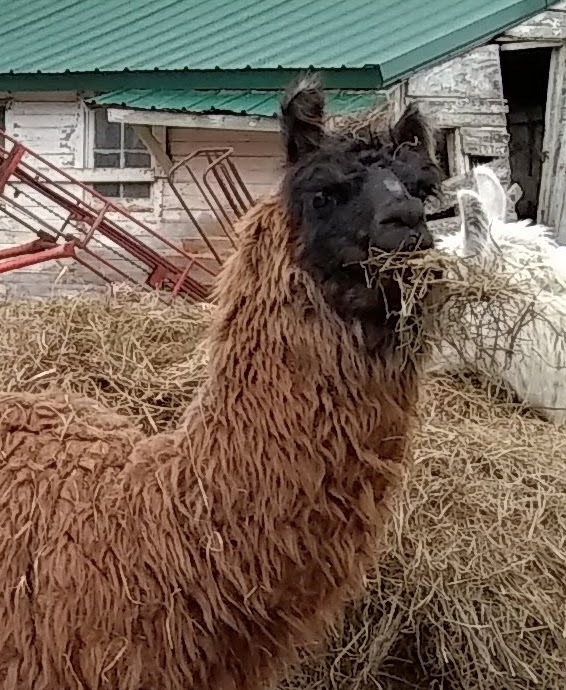 There are 5 in this little group- including the brown llamas: Radar (he sings a lot), Biden (he's a little silly and Obama's side kick), Van Gogh (he is missing part of his ear from previous frostbite). I will post more pictures asap- they are not cooperating with the camera photo ops! I love alpacas and llamas, have I said that 100 times yet? They are SO special and different than any other animal I own- AND might be as close to my own camel as I will get in my lifetime! bwaaahahahaha! The boys are still watching over everyone- from their own pasture. They patrol and graze the 80 acre woods behind us all summer. All the way til they need hay to eat. Usually first of November. They recently had their haircuts for the year. All behaved well except Obama Llama. What? I sure named HIM wrong. He's very much the opposite of Barack Obama who is calm, thoughtful and eloquent. My llama is a screecher for his haircut. We always have to keep a spit sock ready to avoid wearing anything gross. The llamas rarely spit. The only time I've been spit on is when I'm not paying attention during feeding time. They have spit fests at each other. Not good to get caught in the cross fire!